Have you ever noticed how easy it is to hate someone – to moan about them, find faults, ignore them. You know, the hardest choice of all is to love someone. And no matter what the world thinks, it really is a choice to love someone, not a feeling. 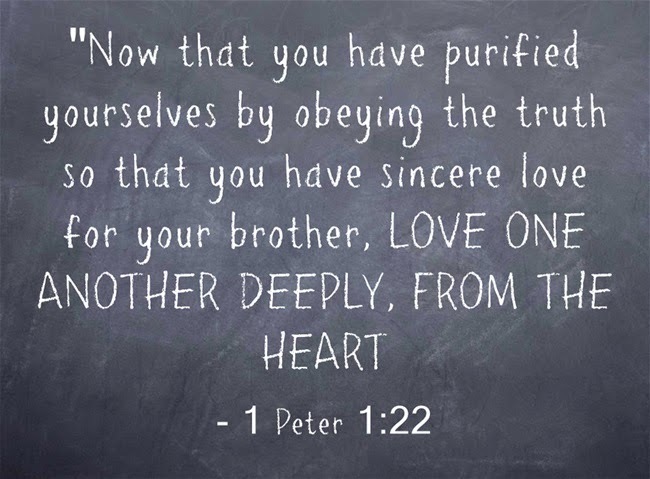 Paul tells us in 1 Peter to have a sincere love for our brothers and sisters in Christ, and often we assume this love will magically appear! Or that it is a different kind of love to what we feel for our spouse, kids and actual family. That is can be a sort of “bear with them”, “love to hate them” kind of love. But this is a lie. We are to love our brothers and sisters in Christ in the same way we love our worldly family (well probably not some of the ways we love our spouse! ), it is just harder because we don’t have that natural first connection. With romantic love it starts off really easy – you feel that connection, that electricity. It is fueled by attraction and lust but hopefully there will be a real connection underneath. By the time that initial honeymoon period dies down, what is left is a true love that is deep in your heart. There are days when you have to choose to keep loving that person, but because the attraction took over in the first few months that awkward period of really having to choose to love them is probably not experienced. But when you first meet a new brother or sister in Christ (or anyone else for that matter) you won’t have that mix of attraction and emotions flying around. Instead, you will have to move from “stranger” to “valued and loved brother/sister” without that. Yes there will be some people who you naturally get on with and it is easy to love them, but as christianity brings in the lost and the broken there will undoubtedly be those who you struggle to get on with. Love is a choice everyday. You don’t just wake up and “Love one another deeply, from the heart” straight away!! But if you keep waking up and making that decision to love someone, there will eventually come a point when you don’t need to tell yourself to do it, it will naturally flow from your heart. This is real love. So perhaps there is someone in your church or community who you really struggle with, who gets your back up and you find really easy to hate. I want to challenge you (and believe me that I am challenging myself too!) to make the decision each morning to love that person. It might be through an anonymous gift or just a positive thought or prayer in their direction. But just keep choosing to love that person until one day you might notice that you don’t have to choose. Your love could change that person and their life so take the jump, sacrifice your own pleasure in moaning about them, and go out there and love them.